Chris Ruisi's launch event and book signing will be celebrated in his home state of New Jersey on Wednesday, November 28th. Contact Susan Belfer at sbelfer@belfercom.com for media attendance. One of his readers offered the following quintessential description of Chris Ruisi: "Here's a guy who has made good decisions and bad ones and knows the difference. He consistently offers common sense wisdom and gives great advice, especially for those in a marketplace embroiled in chaos." Making the choice to be a go-to person is a forever, binding decision. It requires daily practice, a clear mindset, and a constructive offense centered on being the person you want to be. Learn the skills and behaviors necessary to make the most of your relationship with your boss, peers, and co-workers so everyone succeeds. 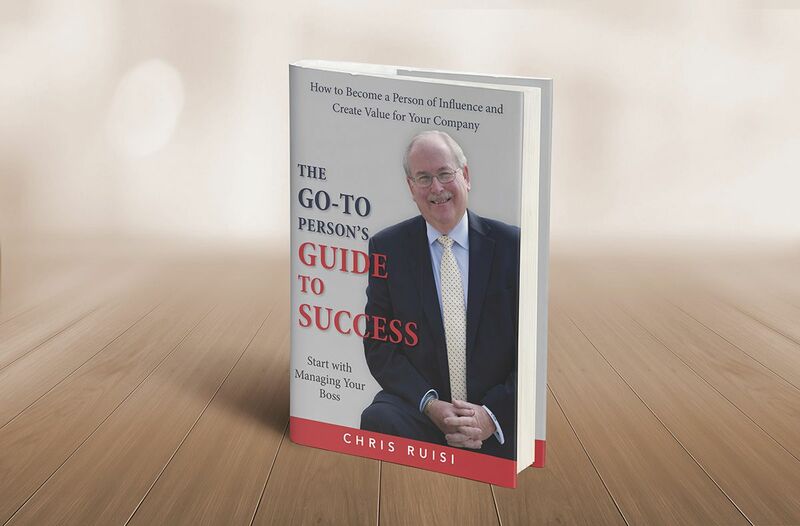 "Chris Ruisi's "Go-to Person's Guide to Success" will help you think differently and open new opportunities in your business, no matter what position you are in, as you have power. If you want to be the go-to person in your company, you must recognize where you are in the company, where you'd like to be, and what you need to do to achieve the right results". Tacy Trump - Senior Executive Producer with World Talk Radio, LLC. Chris Ruisi is a nationally recognized executive coach and leadership expert, professional speaker, global talk radio show host, and author who challenges business leaders to step up and play big. Drawing on his thirty-five-plus years as a senior-level executive on the corporate front lines, Chris helps his clients discover how to use the full measure of their capabilities. Chris draws from his experience as the former president and COO of USLIFE Corporation and as a member of the office of the chairman and the board of directors, where he also served as vice chairman. Using this wealth of knowledge, he helps his clients develop the practical skills and solutions necessary to navigate the risks and demands of the current economic climate. He has offered advice and guidance to CEOs and other C-level executives and entrepreneurs and to several boards of directors on which he has served. Chris combines his detailed insights into the areas of leadership, management, effective team building, and motivation with real-life anecdotes to create humorous, inspiring, informative, and entertaining speaking programs. Throughout his corporate career, Chris has received acclaim as a decisive, respected, and effective leader, among both superiors and colleagues alike. He is recognized for his abilities as a rational problem solver who is able to keep cool and promote solution finding among others. He's the kind of leader who has the unique ability to drive individuals to top performance levels. Success is a choice, and Coach Chris Ruisi is here to help readers make smart decisions, starting with page one. For interviews, copies of the book and other media inquiries, please contact Susan Belfer at 732-239-1559 or sbelfer@belfercom.com.